Sweet Brazilian Coffee for sale. Buy online at Zingerman's Mail Order. Gourmet Gifts. Food Gifts. 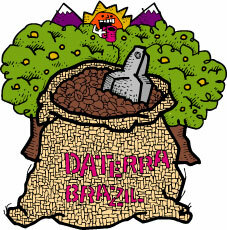 Sweet Yellow are exceptional coffee beans from a very special grower in Brazil named DaTerra. This high-plains estate is Rainforest Alliance certified, with half of the land considered a nature reserve. Fruit trees are still interspersed with the coffee trees in order to provide feed for native birds. The farm is active in its community and in promoting the rights of the workers on the coffee farms. And the coffee? It's made from a series of very special varietals (bourbon, catuai, and caturra, if you're interested) that the folks at DaTerra have spent years working on. Zingerman’s Roastmaster Steve Mangigian treats it gently, so the brewed cup is amazingly sweet, very nutty and super smooth, almost buttery, with lots of happy high notes. Great coffee. Tasting Notes: Sweet, bright and lively with nutty notes and a smooth, full finish.